St Nicholas, Bradwell01493 664421work ChurchSt Nicholas' church in Bradwell near Great Yarmouth of flint and stone construction, was built between 1320 and 1390, and it replaced an earlier smaller building. 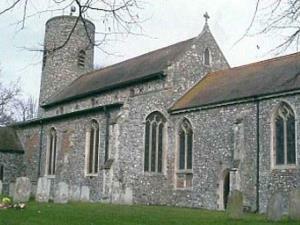 St Nicholas's church has a round tower containing three bells and some beautiful stained glass windows. The church was gutted by fire in the 18th century and not restored until 1875 so most of the furnishings are Victorian. St Nicholas' church in Bradwell near Great Yarmouth of flint and stone construction, was built between 1320 and 1390, and it replaced an earlier smaller building.